A young lion near Nye, Mont. Photo by Kevin Hanly. If Montanans ever decide on a new motto, they might consider something like Terra Multi Fera (Land of Abundant Wild Animals). Owing to Montana’s intact, healthy habitats and science-based conservation practices, the state has long been known as a place teeming with wildlife such as elk, bighorn sheep, pronghorn, mule deer, prairie grouse, and waterfowl. Now add large carnivores to the mix. Across much of Big Sky Country, meat eaters are multiplying. The wolf population has grown from just a few dozen animals a decade ago to at least 625 today. Lion numbers have increased steadily after high harvests in the late 1990s. Grizzlies are more abundant than at any time in the last century. And Montana is home to roughly 13,000 black bears, most of them, like the other big carnivores, living west of the Continental Divide. Whether people welcome or curse this abundance depends on their values and interests. Hunters dislike competing with carnivores for elk and deer, and ranchers see predators as threats to their bottom line. Yet houndsmen are glad for additional mountain lions to chase. And more hikers, campers, and wildlife watchers than ever—many hunters among them—are enjoying the sight of a grizzly feeding on berries or hearing the haunting howls of a wolf pack at sundown. One thing is certain: Having such healthy populations of black and grizzly bears, lions, and wolves combined with so many other wildlife species is unique to Montana among the lower 48 states. For many Montanans and visitors, it’s another example of why the state stands apart. Today Montana is home to more large carnivores than at any time since statehood. The question now is what to do about it. Some say do nothing; let the animals be. 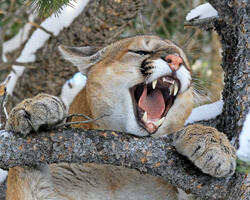 A more reasoned response, taken by FWP, recognizes that large carnivores can pose a threat to human and pet safety, disrupt ranching operations, and take a bite out of deer and elk populations. “Obviously, management is essential,” says McDonald. Essential, yes, but by no means simple. Deer and elk numbers in parts of western Montana are down in recent years, as is hunter harvest. Because wolves, mountain lions, and bears eat deer and elk, it’s logical to conclude that large carnivores are responsible for the prey population declines. And, by extension, that the solution to rebuilding deer and elk herds is to reduce the number of fangs in the forest. But it turns out things are not so straightforward. The main reason: It’s difficult to know for certain what causes what. For instance, though much public attention lately has centered on wolves, the wild canids are only one reason prey numbers and hunter harvests can decline. Habitat is critical. So is winter and summer weather. Then there’s the growing tendency of deer and elk to find refuge on private land closed to public hunting. Add to all this two new studies in Wyoming and Montana showing that mountain lions and bears eat more elk than wolves do in some areas. In response to growing carnivore populations, FWP has liberalized wolf harvest methods, extended seasons, lowered nonresident license costs, and taken other measures to reduce wolf numbers in targeted areas. FWP has also increased lion harvest in dozens of western Montana hunting districts; lengthened the black bear season to increase harvest in western Montana; temporarily curtailed cow elk hunter harvest in key areas (such as the upper Bitterroot, Gardiner, upper Gallatin, and Big Hole Valley) to allow populations to recover; and worked with federal agencies and Indian tribes toward delisting grizzly bears in the Northern Continental Divide and Greater Yellowstone Ecosystems. In addition, wildlife biologists have begun devising customized prescriptions, or strategies, for solving predator-prey problems in parts of western Montana. For instance, in the hunting district on both sides of I-90 between Butte and Missoula—which has a relatively high elk density, a low carnivore density, and lots of private land—FWP is liberalizing wolf harvest to prevent numbers from increasing, while maintaining existing lion and bear seasons. And in the upper Bitterroot—with a relatively low elk density, high combined carnivore densities, and abundant forested public land—the department has temporarily increased female lion harvest and limited cow elk hunting opportunities until elk population numbers improve. “The idea is to customize quotas and seasons to reflect what’s actually going on in each hunting district,” says Mike Thompson, FWP regional wildlife manager in Missoula. Research scientists are monitoring the prescriptions to see if they require adjustment. Though strategies in the areas cited above have shown early signs of success, Thompson says it’s too early to draw conclusions about their effectiveness. In some areas, FWP may also try to grow the overall size of deer and elk populations to overwhelm the effects of predators. “But for that to work, there has to be strong public support, and we’d need to work closely with landowners to provide more available habitat,” says Thompson. A recently released study by the University of Wyoming and Wyoming Game and Fish, funded in part by the Rocky Mountain Elk Foundation and Safari Club International, looked at factors related to elk population declines in a popular northwestern Wyoming herd. Scientists found that the combination of grizzly predation and the loss of nutritious natural vegetation due to drought took a far greater toll on elk than wolves did. “Habitat quality determines elk body fat, which is critical in a cow’s ability to rear calves and survive winter, regardless of predators,” says lead researcher Arthur Middleton. Though wolves kill elk, Middleton found that grizzly bears remove far more of the ungulates than wolves do—preying primarily on newborn calves—a finding that supports an earlier National Park Service study of elk in the Greater Yellowstone Ecosystem. “That’s not to say wolves couldn’t have a significant impact in other areas,” the biologist adds. The upshot? Killing more wolves may not necessarily give prey populations the boost hunters hope it will. Scientists figured out a way to estimate black bear population densities based on precipitation patterns. The study also showed that Montana’s bear harvest was not harming the population and could be increased. A current study is determining if the Northern Continental Divide and Greater Yellowstone Ecosystems grizzly bear population (estimated now at roughly 1,000) is decreasing or, as results show so far, increasing. The information will further the process of federal delisting and restoring state management that could include hunting. In a major mountain lion study, researchers found that raising hunting quotas can rapidly knock down lion numbers, and that lowering quotas can help lion populations recover quickly. In another lion study just finished, scientists found a way to estimate populations in various parts of the state based on the capacity of habitat to support the species, allowing wildlife biologists to more accurately predict mountain lion numbers in various parts of the state. Results of a northwestern Montana study showed that more than 50 percent of whitetail fawn deaths were caused by lions and coyotes. During several studies, scientists have found more accurate ways to determine wolf numbers and the effects of various harvest scenarios on population size. “Without reliable information from these and other applied research projects, we’d risk wasting hunter license dollars on management that ended up not doing what it was supposed to do,” says Justin Gude, head of FWP wildlife research programs. There’s that word again: management. Like control, balance, and healthy, there’s no agreement among Montanans on what the terms mean when referring to large carnivore population size or distribution. Certainly it’s FWP’s job to manage large carnivores and big game, to understand the various factors affecting those populations, and to figure out how to raise or lower populations, primarily with public hunting. But is it up to wildlife officials to decide how many wolves, bears, and lions should live in certain parts of Montana? FWP won’t let large carnivore populations expand to where they unduly harm ranching operations and suppress deer and elk populations. And the agency is bound by law and mission to prevent extinction and maintain viable large carnivore populations. Between those two extremes, however, there’s plenty of room for discussion and negotiation among various interests. FWP can provide science-based advice and guidance. But as to the actual size and mix of meat eater populations across the state, that may ultimately be up to Montanans to decide, collectively, for themselves. Tom Dickson is editor of Montana Outdoors (This story was featured in Montana Outdoors September-October 2013 issue). Editor’s note: Field reports indicate official wolf numbers understate members of actual packs, hence the modifier at least before the 625 figure in this story.